A colloquy is an intimate conversation between you and God the Father, between you and Jesus, or between you and Mary or one of the saints. It often occurs at the end of a prayer period, but it can take place at any time. Let this conversation naturally develop in your prayer. as a lover speaks to his or her beloved. The colloquy is important in the Spiritual Exercises, because Ignatius was intent on people discovering that they could develop a relationship with God that was personal, honest, and uncomplicated. Some traditions use “conversational prayer,” which is basically the same as a colloquy. You communicate with God as you would speak with another person sitting across from you. That is, you say directly and honestly what is going on with you. You imagine Jesus or Mary or another saint sitting or walking with you, and you share what is in your heart and mind. Colloquy can be intimidating for someone whose only prayer has been expressed in traditional prayers memorized and recited. There’s nothing wrong with traditional prayers—they are foundational to the ongoing human conversation with the Divine. They give us words when we’re not sure what to say—remember when the disciples asked Jesus to teach them how to pray? That’s when he gave them what we have come to call the Our Father. Jesus knew that God loves us tenderly as a father loves his children. And children can speak freely to a loving father. Jesus wanted his disciples to internalize this wonderful truth about God’s love. But, in a colloquy, the only words are our own, and that can make us nervous. Will I say the wrong thing? Will I offend God? Why would God listen to me? What do I know about how I should talk with God? We grow more comfortable with colloquy as we do it more often. The first few prayers might be little more than, “Lord, I don’t know where to begin. What should I say to you?” But, just as we get better at talking with people as the relationships grow, after a while, we will be talking with God as with a friend. We speak to a friend with love, affection, respect, and honesty. Sometimes we speak with humor or frustration. It’s all okay. God knows every detail of what we are trying to express through our faltering words. God waits to hear from you. Why not give colloquy a try? 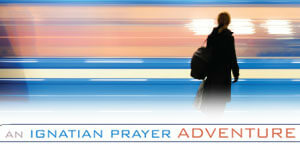 Today in 31 Days with St. Ignatius, consider how Prayer Leads Us Forward in Hope with an article by Becky Eldredge. Follow along everyday this month here and on social media with #31DayswithIgnatius.